of conception. You inherited 23 chromosomes from your mother and 23 from your father. two copies are different) for any given gene. 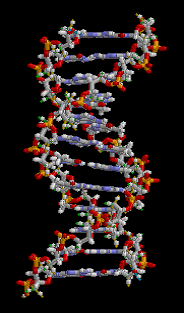 Deoxyribonucleic acid (DNA) is the macromolecule that stores the information necessary to build structual and functional cellular components. It also provides the basis for inheritance when DNA is passed from parent to offspring. The union of these concepts about DNA allows us to devise a working definition of a gene. A gene is a segment of DNA that codes for the synthesis of a protein and acts as a unit of inheritance that can be transmitted from generation to generation. The external appearance (phenotype) of an organism is determined to a large extent by the genes it inherits (genotype). Thus, one can begin to see how variation at the DNA level can cause variation at the level of the entire organism. These concepts form the basis of genetics and evolutionary theory. the nucleus of a cell. Genes control the development and function of all organs and all working systems in the body. A gene has a certain influence on how the cell works; thesame gene in many different cells determines a certain physical or biochemical feature of the whole body (e.g. eye color or reproductive functions). All human cells hold approximately 30,000 different genes. Even though each cell has identical copies of all of the same genes, different cells express or repress different genes. This is what accounts for the differences between, let’s say, a liver cell and a brain cell . Genotype is the actual pair of genes that a person has for a trait of interest. For example, a woman could be a carrier for hemophilia by having one normal copy of the gene for a particular clotting protein and one defective copy. A Phenotype is the organism’s physical appearance as it relates to a certain trait. early splitting of an embryo, but they can be quite different in personality, body mass, and even fingerprints. Genetics (from the Greek genno = give birth) is the science of genes, heredity, and the variation of organisms. The word “genetics” was first suggested to describe the study of inheritance and the science of variation by prominent British scientist William Bateson in a personal letter to Adam Sedgwick, dated April 18, 1905. Bateson first used the term “genetics” publicly at the Third International Conference on Genetics (London, England) in 1906. 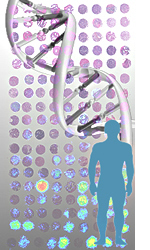 Heredity and variations form the basis of genetics. Humans apply knowledge of genetics in prehistory with the domestication and breeding of plants and animals. In modern research, genetics provide important tools for the investigation of the function of a particular gene, e.g., analysis of genetic interactions. Within organisms, genetic information is generally carried in chromosomes, where it is represented in the chemical structure of particular DNA molecules. required for protein synthesis. Gregor Mendel researched principals of heredity in plants. He soon realized that these principals also apply to people and animals and are the same for all living animals. Gregor Mendel experimented with common pea plants. Over generations of the pea plants, he noticed that certain traits can show up in offspring with out blending any of the parent’s characteristics. This is a very important observation because at this point the theory was that inherited traits blend from one generation to another. Mendelian inheritance – the modern synthesis starts. 1995 The genome of Haemophilus30 influenza is the first genome of a free living organism to be sequenced. 1996 Saccharomyces31 cerevisiae is the first eukaryote genome sequence to be released. 1998 The first genome sequence for a multicellular eukaryote, C. elegans32 is released.